A car bomb exploded outside a crowded market in northwestern Pakistan on Tuesday, killing at least 24 people in the latest attack by suspected militants apparently aimed at avenging an army offensive along the Afghan border. The bombing, aimed at causing maximum civilian casualties, was the third blast in as many days in or close to Peshawar, the capital of the North West Frontier Province, an area bordering the tribal region where the army is pushing into a key Taliban and al Qaeda sanctuary. The bombing will likely be followed by further attacks targeting urban areas, a senior intelligence official told CBS News. The official, who spoke on condition of anonymity said, "such attacks will go on to target cities in different parts of Pakistan as the Taliban seek to force the military to step back" from its ongoing anti-Taliban offensive in the country's south Waziristan region. The blast in Charsadda, some 25 miles north of Peshawar, was caused by some 90 pounds of explosives stuffed into a van, said the senior police chief in Peshawar, Liaqat Ali Khan. Authorities were investigating whether the attack, which killed at least 24 people and wounded 102 others, was carried out by a suicide bomber, he said. Rashid Kaka said he was returning from the mosque to his shop in the market when the bomb exploded, destroying stores on both sides of the road and knocking down electrical wires. "It was deafening and there were clouds of dust all around. I could not see anything around me," said Kaka. "Later I saw many bodies lying scattered." Foreign Minister Shah Mahmood Qureshi condemned the attack, calling those behind it the "enemies of Islam. No one claimed responsibility, but authorities have blamed similar attacks in recent weeks on the Taliban. Pakistan's intelligence and military officials have warned that the Taliban have built centers in south Waziristan to train militant volunteers in carrying out armed and suicide attacks. "We are in a hugely difficult phase in our campaign against the Taliban. We are getting an edge on them and you can be certain they will eventually be defeated," the official told CBS News, though he cautioned that "as we take our campaign forward, they will surely fight back." A western diplomat who spoke to CBS News, also on condition of anonymity said, said it was too early to predict if the Taliban were losing or gaining ground in spite of the military's campaign. South Waziristan is closed to journalists and there is no way to gain an independent assessment of conditions on the ground. "Guerilla-type outfits around the world are known to have the capacity to sustain themselves for a long time," said the diplomat. "What we can all be certain of is essentially that there will be plenty of bloodshed as we go forward." 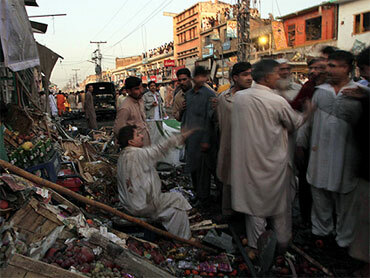 On Monday, a suicide bomber in a rickshaw detonated his explosives near a group of policemen in Peshawar, . A day before, a suicide bomber blew himself up in a market south of Peshawar, killing 12 people, including a mayor who once supported but had turned against the Taliban. Less than two weeks ago, a car bomb killed 112 people in a market in Peshawar, the deadliest attack in Pakistan in more than two years. The government has pledged to press ahead with the offensive despite the assaults. The U.S. supports the South Waziristan operation because Pakistan's tribal belt is home to many militants involved in attacks on Western troops across the border in Afghanistan. Mian Iftikhar Hussain, information minister for North West Frontier Province, said Tuesday's bombing was evidence the government crackdown was putting pressure on the militants. "They are not able to target freely, and that's why they are targeting innocent people," said Hussain. "But we and the people of Pakistan are determined to continue this jihad against terrorists undeterred." Pakistan's army has pitted some 30,000 troops against up to 8,000 militants in South Waziristan, including many Uzbeks and other foreign insurgents who have long taken refuge in the lawless tribal areas. The soldiers have been battling militants in three key Taliban bases in South Waziristan over the past few days. The latest fighting has killed nine militants, an army statement said Tuesday. The information is nearly impossible to verify independently since Pakistan has blocked access to the battle zone.